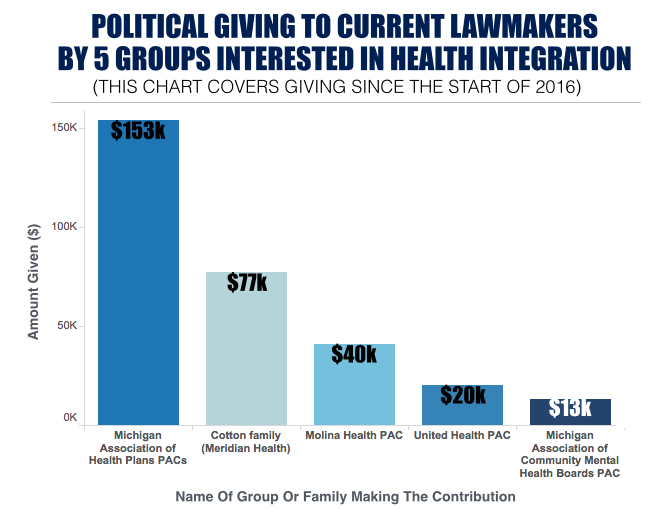 LANSING — Michigan lawmakers who will decide whether to hand health insurance plans a victory this spring have received about $1 million in contributions from committees and executives connected to the plans. At stake is who will provide services for people with mental illnesses, developmental disabilities and substance use disorders and who will oversee the $2.6 billion in annual Medicaid dollars that are paid for those services. Of that $1 million in contributions, $292,100 has come since the start of 2016 when the fight for control of the state’s behavioral health system began, according to a review of public disclosures by the Michigan Campaign Finance Network and Michigan Radio. The examination focused on eight years of campaign contributions in order to get a clearer picture of the financial relationships cultivated with lawmakers over time. Currently in Michigan, a publicly managed system provides behavioral care for Medicaid enrollees, while the health plans are responsible for physical care. Virtually everyone involved – the health plan leaders, the advocates, and the providers – agree that integrating mental health care with physical health care will both improve outcomes and cut costs for the estimated 250,000 people using the system. The disagreement lies in who would control the billions in annual Medicaid dollars that would be used to make the changes. Advocacy groups demand that control of the funding remain in public hands. The health plans want to lead the integration themselves, a change that would be certain to grow their business in the state by sending more Medicaid dollars their way. In the past two weeks, that growth came closer to reality in legislative committee meetings. On April 18, a state Senate subcommittee approved a budget amendment from Sen. Mike Shirkey, a Republican from Clarklake. Shirkey’s amendment stated that the Legislature’s goal would be to fully integrate the behavioral and physical systems under the health plans by Sept. 30, 2020. Senator Shirkey received more contributions over the last eight years from health plan donors than any individual lawmaker at $76,250. Shirkey’s total includes a $25,000 contribution to his leadership PAC, Compete Michigan, a day after the April 18 subcommittee meeting in which he introduced his amendment favoring the health plans. According to Compete Michigan’s disclosure filed this week, the PAC received $25,000 from Jon Cotton, president of Meridian Health Plan, on April 19. In an interview, Shirkey dismissed the idea that the contribution or other contributions were tied to his support for the health plans on the integration. Instead, Shirkey said he’s been out making his case to be in Senate leadership next session. Cotton wants to support him, Shirkey said, and the contribution came just before the April 20 deadline for the first fundraising period of 2017. Shirkey said Michigan is currently underinvested in mental health services, and integration led by the health plans could free up dollars to better manage the behavioral side of care. Plus, he said, Michigan’s managed care system is high performing and should be deployed to provide behavioral care. On the House side of the Legislature, Rep. Laura Cox, a Republican from Livonia, has also received contributions from the Cotton family. Her leadership PAC, Shamrock PAC, reported receiving $25,000 from Jon Cotton on Oct. 14, 2016. Currently, serving her second term as a member of the House, Cox has received more contributions from health plan-connected donors than any other individual House member at $34,360. Cox is the chair of the House Appropriations Committee and proposed an amendment last week to the House budget plan that would require up to three integration pilots through contracts with the health plans. Cox didn’t provide comment after a request was put in through a spokesperson. Cotton, Meridian’s president, has spoken out in favor of integrating the health systems and for pilot programs so the state can test out the health plans’ performance in behavioral care. “We just want a chance to prove ourselves,” Cotton told Crain’s Detroit Business in March. Over the last eight years, Cotton’s family has given about $356,250 to current lawmakers, their parties and their fundraising committees. Among the largest individual contributions have been $25,000 to Shirkey’s PAC and $25,000 to Rep. Cox’s PAC. He and Meridian Health didn’t respond to requests for comment for this story. Gov. Rick Snyder’s budget presentation in February 2016 jump-started the debate over who should manage Michigan’s behavioral health system. At the time, Snyder proposed putting the system under the health plans, which set off protest from groups who wanted the system to remain public. At the legislature’s direction, a workgroup was convened to devise a way forward and recommend pilot projects that would better integrate behavioral and physical health care. It included representatives from the health plans, advocacy groups, and providers and payers such as officials from Community Mental Health and Department of Health and Human Services. That workgroup says it engaged more than 1,113 people over more than 45 meetings, including more than 700 consumers and family members. As CEO of the Mental Health Association of Michigan, Marc Reinstein was a member of the workgroup. He said that while the consumers and families who showed up said they were not happy with the current system, they overwhelmingly objected to letting the health plans take it over. Kevin Fischer, CEO of National Association of Mental Illness -- Michigan and also a member of the workgroup, said the fears include a loss of public oversight, diminished services, and any savings lost to shareholders and executive bonuses instead of being reinvested in care. Fischer said the system should be bottom-up, not top-down. The decisions about integrating someone’s physical and behavioral care belong at the client-level, he said, where consumers, their families and providers can decide on the best plan of action, and not at the funding level, which the health plans propose. “We do not want to have a system where a health plan says you get six doctor’s visits and your pills and that’s it,” Fischer said. The workgroup submitted its final 143-page report to the Legislature in March 2017, which rejected the Governor’s proposal to transfer control of services to the health plans. The report called for numerous other changes, however, including publicly led pilot programs and partnerships with health plans to test new ways to deliver care. After signing off on a number of the workgroup’s proposals, the Michigan Association of Health Plans, a nonprofit organization that advocates for health plans, submitted its own alternative report, calling for full integration by Sept. 30, 2020. 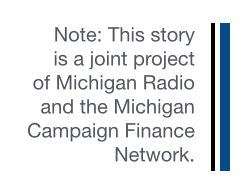 In a March 17 interview on Michigan Radio’s Stateside, the association’s executive director, Dominick Pallone, said the health plans didn’t feel their views were represented in the workgroup’s report. He added that there will still be public oversight of the Medicaid contracts and the health plans will continue to work with the Community Mental Health agencies, preserving the existing structure. The competing reports have focused attention on the Legislature, which is now in the process of setting the budget for Fiscal Year 2018. While all sides have been lobbying actively, the health plans have been a much larger player in campaign giving over the years. They were among the top advocates for expanding Medicaid coverage in Michigan in 2013. 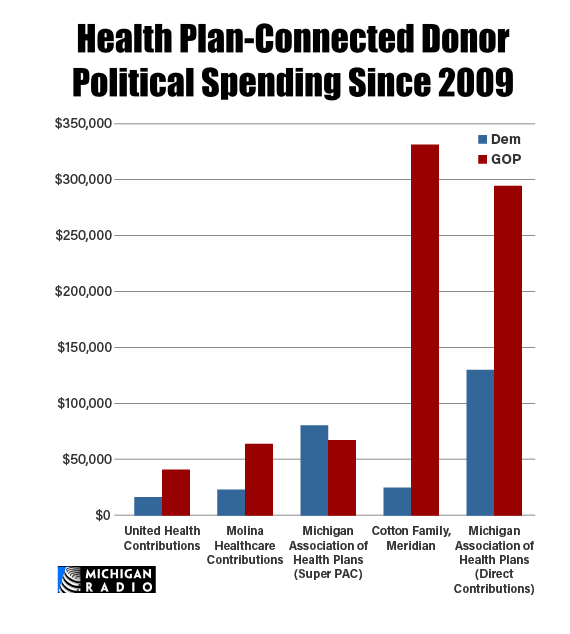 An examination by MCFN and Michigan Radio of the last eight years – a span that shows the relationship between the group and lawmakers over time – shows Michigan Association of Health Plans’ political action committees (PACs) have given $572,635 to lawmakers currently serving in the Legislature, their parties and their fundraising organizations. The total doesn’t include giving to former lawmakers. Since the start of 2016, the association’s PACs have given about $153,900. The association also disclosed spending $253,278 on lobbying in 2016. Dave Waymire, spokesperson for the Michigan Association of Health Plans, said the organization has been involved in numerous legislative and administrative efforts that have benefited the people of Michigan, particularly children and those with disabilities over the years, including Medicaid expansion and the protection of Medicaid funding. The association also believes that its plan for integration pilots “is worth moving forward on to determine if we can improve a system that all agree is failing to meet the needs of some of our most vulnerable citizens,” Waymire said. In addition to the association, groups connected to the association do their own political giving. A lawmaker who declined to be named said he’s been visited recently by representatives Molina Healthcare and United Health Group, two plans involved in the association. Over the last eight years, Molina’s PAC has given $87,230 to current lawmakers, and United Health’s PAC has given about $57,250. Since January 2016, they’ve given $40,700 and $20,000 respectively. The Cotton family of Meridian Health Plan has given $356,250 to current lawmakers over the last eight years while $77,500 of that total since the start of 2016. Fischer said he wasn’t surprised by the contribution numbers. Tom Watkins, CEO of the Detroit Wayne Mental Health Authority, said the discussion shouldn’t be “about who's making the best and the biggest political contributions” but about the people and family members whose lives depend on this care. “That is not something that should be up to the highest political bid, I think that would be travesty,” said Watkins. Watkins said the language advancing in the Senate seemed to ignore the workgroup’s recommendations, which he said came after a year of preparation and more than 100 people working on them. Watkins’ side of the debate has also made contributions and does lobbying. For instance, the Michigan Association of Community Mental Health Boards PAC has given $40,600 to current lawmakers over the last eight years. The association reported spending $31,673 on lobbying last year. The integration language advancing in the Senate and the House has yet to receive a vote from either full chamber. 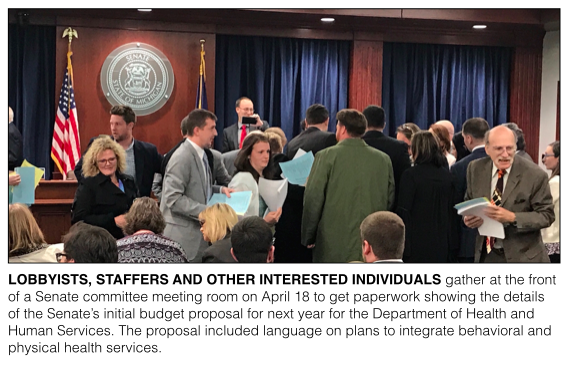 Eventually, lawmakers from the House and the Senate will have to agree on what pilot projects to offer, who leads them and what language to include in the budget. Setting a goal of integration under the health plans down the road would also require action by future lawmakers to enforce the goal. 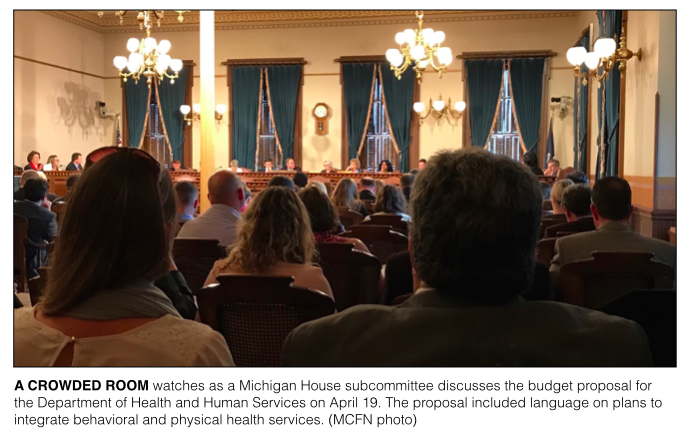 Reinstein, the head of the Mental Health Association of Michigan, said he and the other advocates are going to keep lobbying for public control of the behavioral health system, but wasn’t certain how much difference it would make.